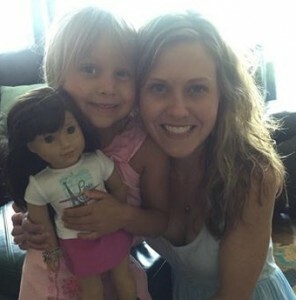 My daughter, Elyse, turns six next month and has had her eye on the Doll of the Year, Grace Thomas, from American Girl. That is a slight under exaggeration since she daily flips through the American Girl catalog. 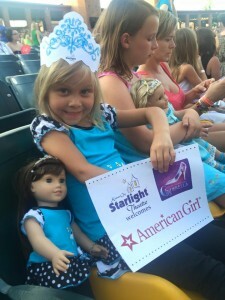 I decided to surprise her with Grace as an early birthday present and take her to Starlight Theatre with the American Girl to see "Cinderella." She was beyond thrilled! Dressed in their matching outfits we headed to the American Girl store where Grace was treated to a royal hair do and a tiara at the salon. Elyse then posed her Grace with one of the Samantha dolls on display for a photo since her friend has that doll and the dolls are “friends.” Then we headed over to Barnes and Noble to grab a snack before the bus arrived. As we boarded the bus Elyse was handed a goodie bag with a magazine, a pumpkin craft and a couple articles of clothes for her doll. She was most excited about the sequined buret because it’s what painters wear and Elyse wants to be an artist and fashion designer when she grows up. When I shared with her that Grace likes Paris, the fashion capital of the world, Elyse squealed with excitement and said she and Grace wanted to go with daddy on one of his business trips to Paris. I smiled at the thought and realized that my little girl has an amazing zest for life and big dreams. On the bus ride there we made movies on my phone of her interviewing Grace about the show. Once we arrived at Starlight Theater we headed to the fairytale festival before dinner and the show. 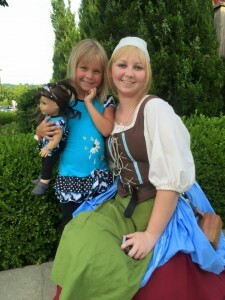 She met Cinderella, but was most mesmerized by the man on the seat in the dunk tank. While most of the other girls stood in line to get their faces painted she spent most of our time throwing balls at the dunk tank target. She had three tries and then would go to the back of the line to try again. Each time she got closer to hitting the target, but never did dunk the taunting man on the seat. Her good spirited persistence was admirable and she enjoyed a few laughs when others got him dunked.